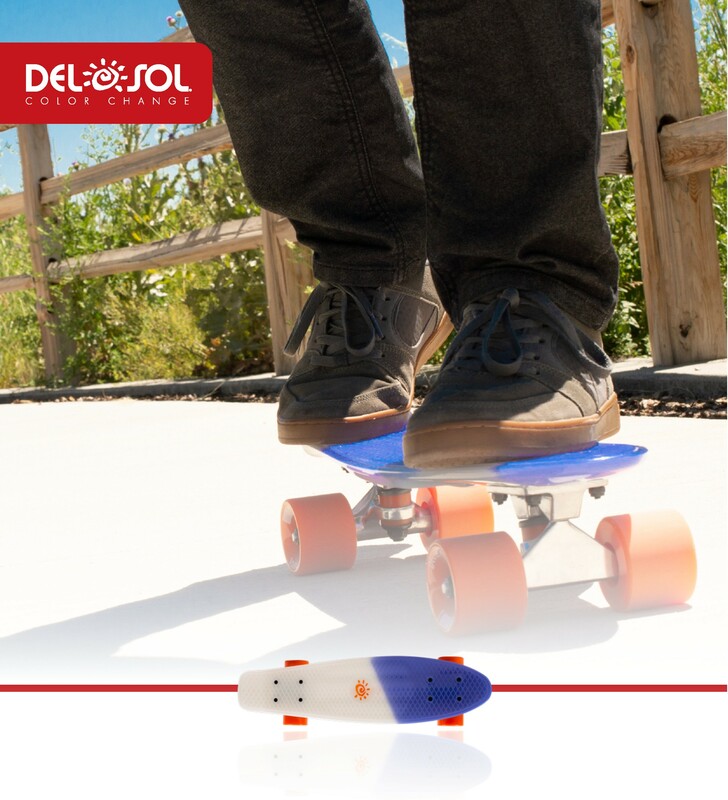 Del Sol recently introduced its new pennyboard-style skateboards that change color with sunlight to Del Sol inline and online stores and Del Sol customers worldwide. Whether you’re grinding, carving or cruising down Main Street, Del Sol’s new, sun-stoked skateboards let you catch air and rays at the same time. They’re greatly improved from previous iterations – they’ll last longer, ride smoother and be stronger for jumps, tricks and turns! A “penny” style board is a smaller, lighter-weight skateboard that’s typically composed of plastic with hard metal trucks and bearings. The first plastic skateboards were introduced in 1983 by smaller skateboard companies, often owned by skateboarders themselves. These types of skateboards are mainly used for cruising – a simple mode of transportation. However, they can and have been used for tricks. The main benefit of pennyboards over skateboards and long boards is their compact size that fits easily in small spaces, making it the ideal choice for traveling (fits in most suitcases – even a carry on) and getting around campus or town (fits easily under your seat or in a locker). The variety of colors and designs make them a popular fashion accessory for teenagers and young adults, influencing clothing styles, music and street culture. Sol Skateboards come in two different color options, and each changes from one color without sunlight to a completely different color with sunlight. They appeal to all ages and genders, and they’re not just for skaters. Everyone can (and should!) ride a skateboard for fun. Skateboarding is one of the fastest-growing sports among females, too. New and improved color-change vibrancy combined with a sweet board makes for even more fun in the sun. Sturdier trucks, axle, bushings and wheel construction throughout for a smooth ride. High precision ABEC 11 wheel bearings. We’ve tested our Sol Skateboards at various skate parks on ramps, rails, and other obstacles. Everyone who uses one raves about it. If you know someone who already has a skateboard or pennyboard, that’s great! Usually skaters buy more than one board for different looks and different purposes. Adding a color-changing board to their collection is something they’ll definitely love. Sol Skateboards retail for $79 online or in most Del Sol stores.